Marble tops acid-etch and stain. Our CLEARSTONE treatment prevents it from happening. CLEARSTONE is the worlds first and best coating to protect marble top surfaces from acid-etching and staining – GUARANTEED for at least 15 years! The coating is absolutely clear and natural looking and available in either a polished or honed appearance. Marble tops burn when they come in contact with acidic products such as soda pop, alcohol, soap, ammonia based window cleaner, lemon juice, vinegar and wine. The etch appears as a dull spot. It can be restored by a trained restoration contractor but can etch again the next day. Fixing an acid-etch will not prevent it from happening again. Until now marble tops in the United States did not have access to the only product in the world GUARANTEED to prevent acid-etch and staining leaving the stone looking natural. CLEARSTONE is not new. It has been used in other parts of the world for over 15 years but has just become available here in the United States in the summer of 2012. 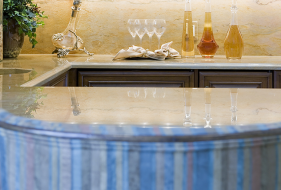 CLEARSTONE can be installed on any top such as a vanity or kitchen top, a bar or the like. It is not yet available for application to floors or walls and can only be installed by trained applicators. Please review information on our site and let us know if we can be of service! While many leading brand stone sealers offer a similar 10-15 year guarantee against just staining, CLEARSTONE™ offers the same protection against staining and the more problematic acid-etching. CLEARSTONE™ is a protective coating, not a sealer. Once coated, the stone itself no longer comes in contact with potentially damaging substances which can cause etching. Please visit CLEARSTONE™ for more information.